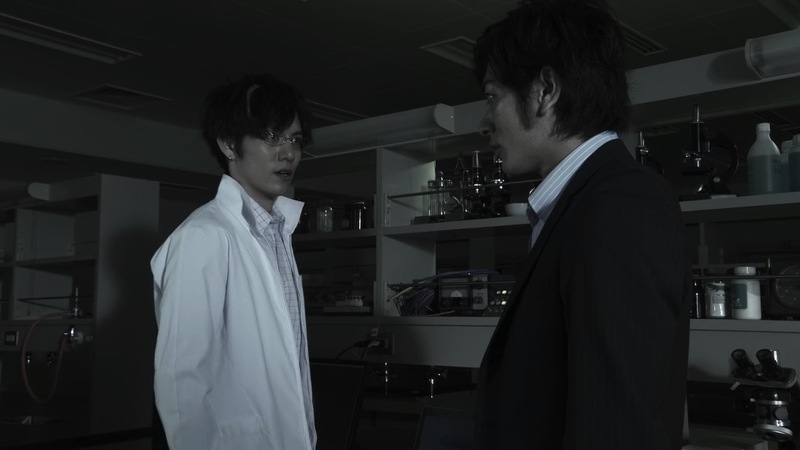 Set just before Ryouma Sengoku appeared on the scene with the rest of the New Generation Riders, the Kamen Rider Duke segment of the story follows the scientist as he investigates a number of terrorist attacks on the Yggdrasil Corporation. The attacks are being carried out by seemingly brainwashed civilians carrying explosive Lockseeds, linked only by the mysterious Black Bohdi cult. As Ryoma and Takatora look into the matter further, Ryouma comes face to face with a supposedly dead colleague – now brandishing Lockseeds of his very own. One of the biggest issues with the Gaim Gaidens is the way that they introduce their exclusive Riders and/or Lockseeds. They’re often shoehorned in with little to no explanation about how they’ve managed to get their hands on Drivers, and ultimately serve little purpose than to help sell the web exclusive toys sold in tandem with these films. 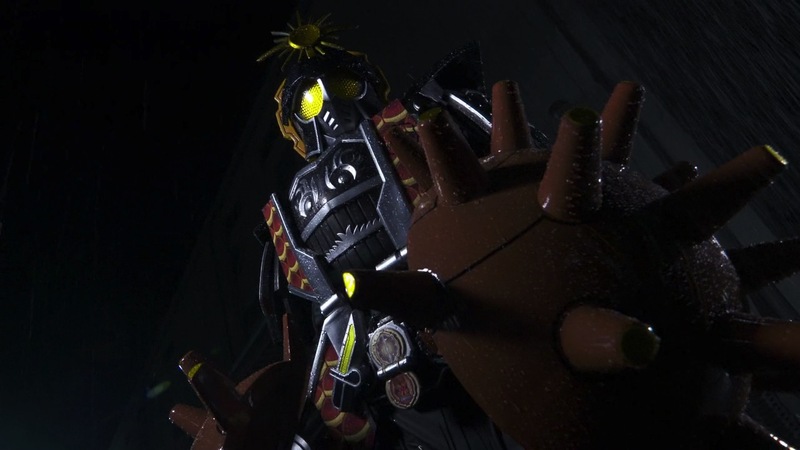 However Kamen Rider Duke is one of the few characters they can get away with making such additions. With Ryouma being the creator of the Drivers, it seems only natural that he might have a few other trinkets up his sleeves that didn’t show up in the series narrative. 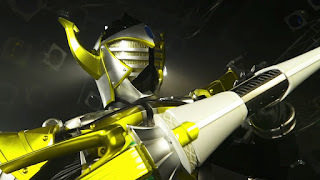 Lemon Arms is the perfect precursor to the Duke we saw in the series – adding a crucial glimpse into Ryouma’s past as a Rider while in no way overshadowing the far much powerful Energy version. The fact such a minimal amount of fuss is made about it in the story works to its favour as well – if anything Lemon Energy is the one that receives all the fanfare. Less can be said however for his opponent – Kamen Rider Saver Blood Zakuro Arms, a zombie-like mishmash of any parts Toei probably had lying around the studio at the time. 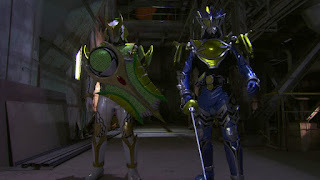 While ultimately a Kamen Rider Duke Gaiden is going to be a story primarily focusing on Ryouma, that doesn’t stop it from giving a bit of insight into the other Yggdrasil Riders either. As well as getting some better insight into his relationship with Takatora, we also get some glimpses into how Ryouma became associated with the likes of Sid and Minato. Presented in flashback sequences with some truly brilliant haircuts, these origins of sorts for the two characters aren’t fleshed out enough to provide a full sense of satisfaction but are comforting in that they’ve provided some background for them should their Gaidens never come to fruition. The important thing is that these first meetings perfect capture Ryouma as a character – a master manipulator with a superiority complex, able to read people and use them for their strengths but with every intention of casting them aside. He’s a villain through and through, but you still can’t help but feel charmed by him. It isn’t long enough to give them full back story the character deserves, but the Kamen Rider Duke Gaiden defies all odds to be a genuinely enjoyable production. The new characters don’t feel as shoehorned in as usual, and actually work without raising more questions than they answer (plus it feels completely in Ryouma’s character to be as blasé as he is about these things). It isn’t so much an exercise of filling in all of the gaps like many probably would have hoped, but a true side story that gives a new look into one of Gaim’s most memorable characters. Meanwhile the Kamen Rider Knuckle chapter acts as the latest entry in the Kamen Rider Gaim story, taking place one year after the events of the series and Movie Wars Full Throttle. After Zack leaves Zawame City to chase his dreams in America, he is called back by Peko’s elder sister Azami when a group of thugs appear in Zawame naming themselves Team Neo Baron. Soon Zack is facing off against someone from his past as well – Shura, a dancer and former friend thrown out of Team Baron shortly after Kaito took over as leader. 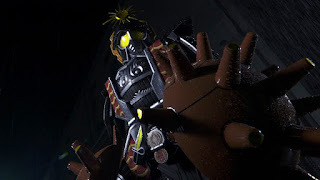 Donning the mantle of Kamen Rider Black Baron, Shura plans to continue Kaito’s legacy in his own twisted way by ensuring that only those he deems as strong survive. With a new Driver and a new Lockseed at his disposal, Zack becomes Kamen Rider Knuckle once again to defeat Shura and honour Baron’s memory. After getting off to a great start with the Kamen Rider Duke portion of this release, it doesn’t take long for the Knuckle half to regress to the same level of quality as the Zangetsu/Baron ones. The story randomly kicks off with taking Zack to New York for all of five minutes (complete with an impressive amount of English dialogue) before having him return to fight Zawame City’s own fight club, led by a man thrown out of Team Baron by Kaito but now practically idolising him. And this man’s ultimate plan – killing a bunch of people with a random weapon that’s suddenly been pulled out of nowhere by the apparent remnants of Yggdrasil (who have even had the means to make their own Drivers). The whole set up is dumb, and laughably so. But it’s like the writers were completely unaware of this, making the whole thing seem as dramatic as possible with its gritty fistfights and final showdown in the pouring rain. Once again it pulls brand new characters out of thin air and creates an overly forced emotional attachment, only this time it expects the audience to believe that they’ve effectively been around the whole time. And the less said about Peko the better – at this rate he’s going to need a Gaiden of his very own just to be a character that ever amounted to anything. The new suits added aren’t much better either, as Knuckle’s new upgrade misses far more marks than it hits. The Jimber Arms concept was one that was woefully underutilised in the series itself (anyone remember that Zangetsu Jimber Melon rumour? Who wouldn’t have wanted to see that?) so it is nice to see it re-explored here, but perhaps Knuckle wasn’t the best character to do that on. The ornate qualities of the Jimber pieces do not mesh at all with Knuckle’s scrappy boxer aesthetic, so the end result is something that’s trying to look quite regal and imposing but has giant walnuts for hands. 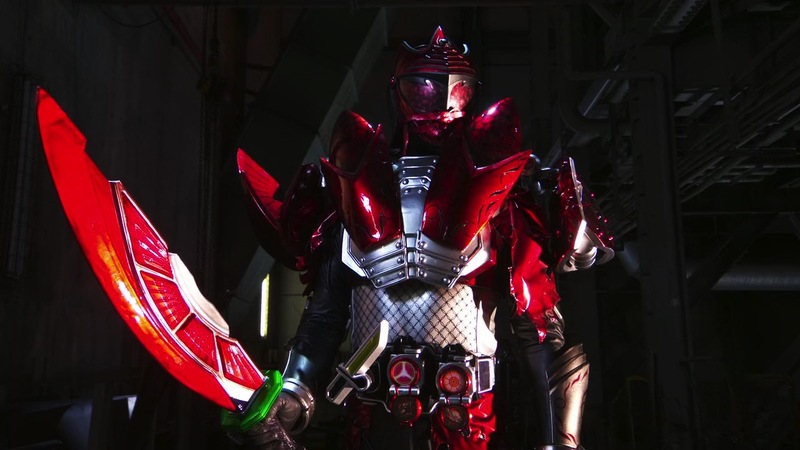 Gaim was hardly a series to shy away from ridiculous weapons, but previously it knew how to streamline things a bit better when it came to the bigger power ups. Meanwhile Black Baron is exactly that – a black version of Baron. In its defence it comes off much better visually since it isn’t a mishmash of parts like Saver, but a black recolour is only so exciting and in the hands of such a forgettable character doesn’t leave much of an impression. And even though it tries (and fails) to play the story as straight-faced as possible, there are some genuine laughs to be had. Usually thanks to the Kaito flashbacks, which inadvertently play into the film’s overall sense of silliness. It’s a pity that the Baron Gaiden couldn’t have been better, because even in someone else’s spotlight Yutaka Kobayashi proves to be the real star of the show. The Kamen Rider Gaim Gaidens still have a way to go to be of the same high quality as the series itself, but this feels like a step in the right direction. While Duke’s would have certainly benefitted from a longer running time, unlike the others it feels like a decent expansion of Ryouma’s character and makes some additions (both story-wise and suit-wise) that both make sense and feel like they have a natural place in the Gaim universe. Unfortunately the same can’t be said for the Kamen Rider Knuckle segment, which feels like another unnecessary addition to a series which doesn’t really need anything else to enhance it. On the other hand, the Knuckle story is so gloriously absurd that you can’t help but find some enjoyment in how ridiculous the whole thing is – which is a better reaction than either the Zangetsu or Baron ones provoked. 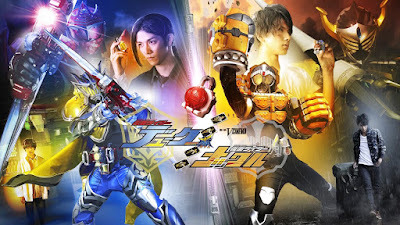 I still can’t say that the idea of a third Gaim Gaiden excites me in any way, but at least after these I can try to have semblance of hope that Toei can construct a half-decent story if they choose the right character. Personally my pick would be Kougane (aka Kamen Rider Mars and later Jam) – because who wouldn’t want to see a story taking place long before the series and mostly starring the Overlords? True he may be a bit player in the grand scheme of things – but I’d rather that than have any of the good characters left have to suffer one of these.